People in San Diego can be rather cynical about Pacific Beach, especially when it comes to dining options in this notoriously bar-driven neighborhood. When recommending restaurants around town, it's rare that one names somewhere among this area known by many as a raucous college scene. 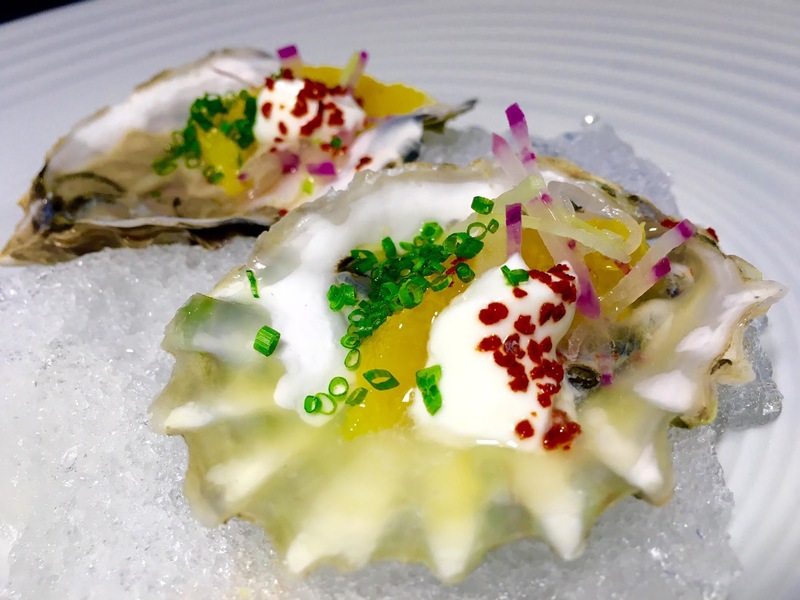 That is all about to change, as Chef DJ Tangalin has put the underappreciated beachside neighborhood on the dining destinations map now that he is leading the kitchen at JRDN. We recently enjoyed a staycation at Tower 23 Hotel that was highlighted by an incredible chef's tasting menu at its in-house eatery. 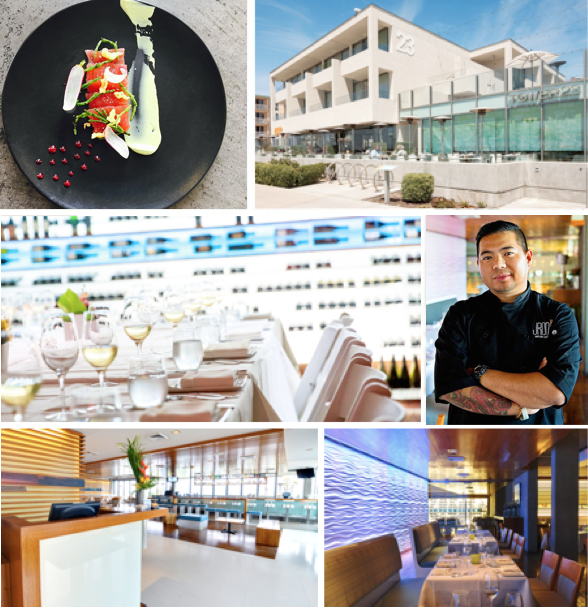 Set centrally between La Jolla and downtown San Diego, Tower 23 is a 44-room, contemporary, glass-paneled hotel that overlooks the Pacific Ocean, Crystal Pier and sits conveniently on Ocean Front Walk. Its chic rooms feature modern amenities, as well as private balconies or patios, minibars, flat-screen TVs and free WiFi. Our suite even included a luxurious “chromatherapy” floating whirlpool Jacuzzi tub with an awesome fixture that gives the illusion of water falling from the sky. The hotel also offers a rooftop lounge with fire pits perfect for watching the sun dip into the ocean, a private meeting and banquet room, and an onsite restaurant - JRDN - which serves upscale Californian cuisine with an amazing view. 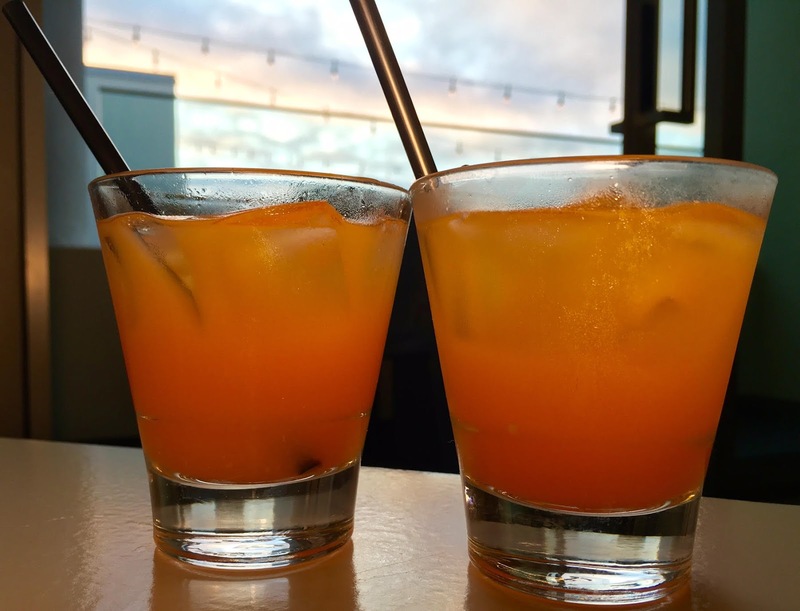 We've always enjoyed JRDN and make it a point to take any and all out-of-town visitors there, at least for sunset happy hour. The restaurant is criminally underrated. The mussels are some of the tastiest in the city, and the lobster BLT (during lunch and brunch) is the stuff of legend. So when we were recently invited in for a complimentary staycation and dining experience, we couldn't resist (even though it's only a few blocks from where we live). 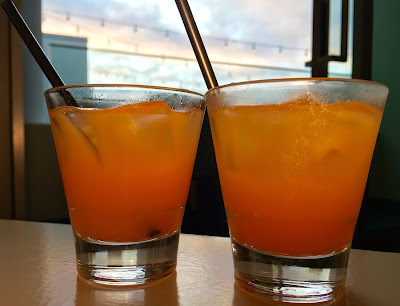 After checking in to the beautiful Sanctuary Suite and enjoying our welcome cocktails, we made our way down to JRDN for an early dinner while watching the sun descend over PB's Crystal Pier. 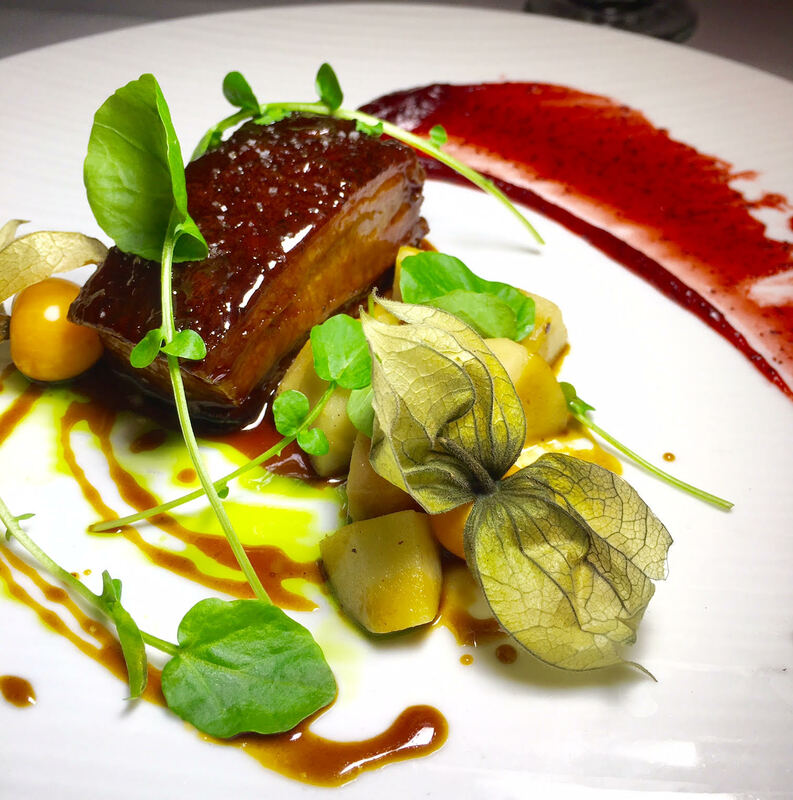 Our service was beyond exceptional and we were offered a tasting tour of some of Chef DJ's favorite creations. We happily obliged! 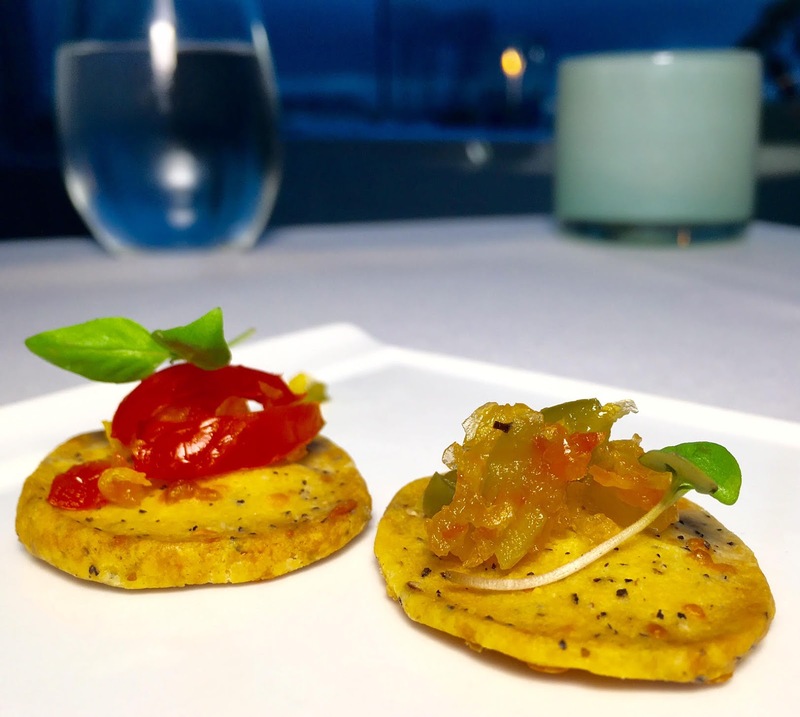 Our culinary journey began with a couple of frosty craft brews and an amuse bouche - crispy housemade cheese crackers topped with a sweet and spicy pepper jelly, an addiction-worthy party pleaser that should be boxed and sold. 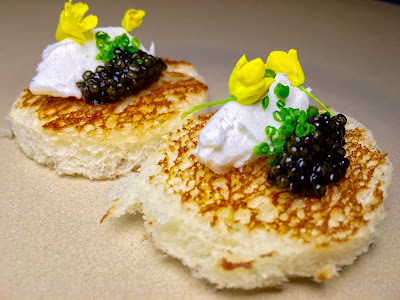 Next came a quick favorite - salty sturgeon roe with buttery cream cheese and chive on light and fluffy brioche. The roe was certainly the star, providing intense flavor and texture, complemented by the other components of this super simple, yet elegant dish. A refreshing interlude was presented next - fresh and plump Minter Sweet oysters were topped with tangy Cara cara navel orange, spicy Aleppo chili pepper, purple radish, lime creme and chives. Slurp! 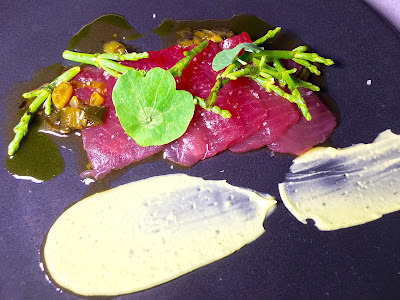 The most buttery and delicious Bluefin tuna was delicately sliced and topped with crunchy, pickled sea beans and savory charred spring onion, sided by an airy avocado mousse, demonstrating Chef DJ's skilled artistry and restraint. A tough act to follow, but the apple salad delivered. Tart green apples played beautifully with frisee, endive, creamy brie cheese, thinly sliced grapes, and toasted almonds, all topped with a slightly sweet honey, lemon and cardamom dressing. 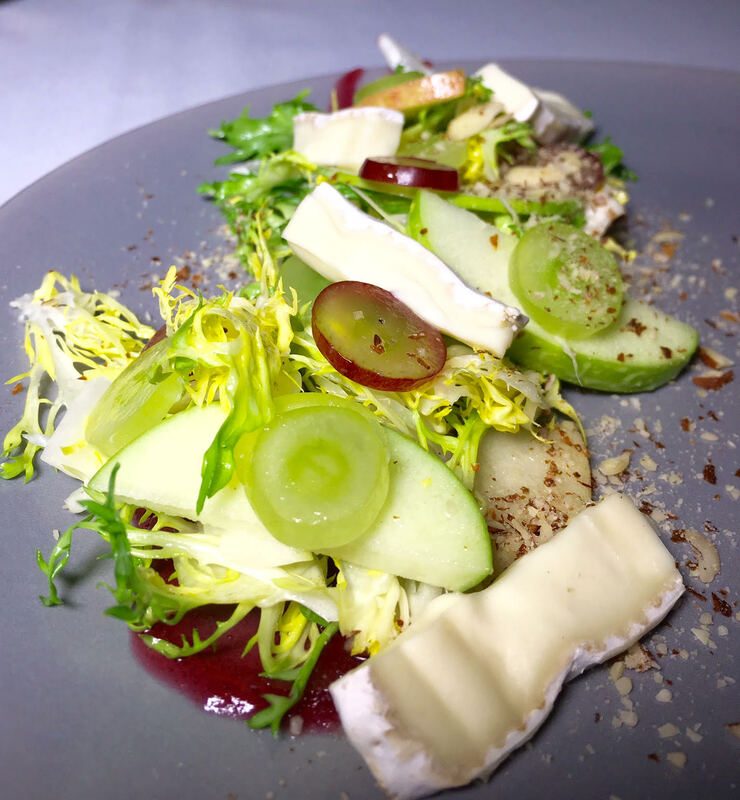 We didn't believe it to be possible, but each dish surpassed our expectations and grew increasingly delicious with every course. 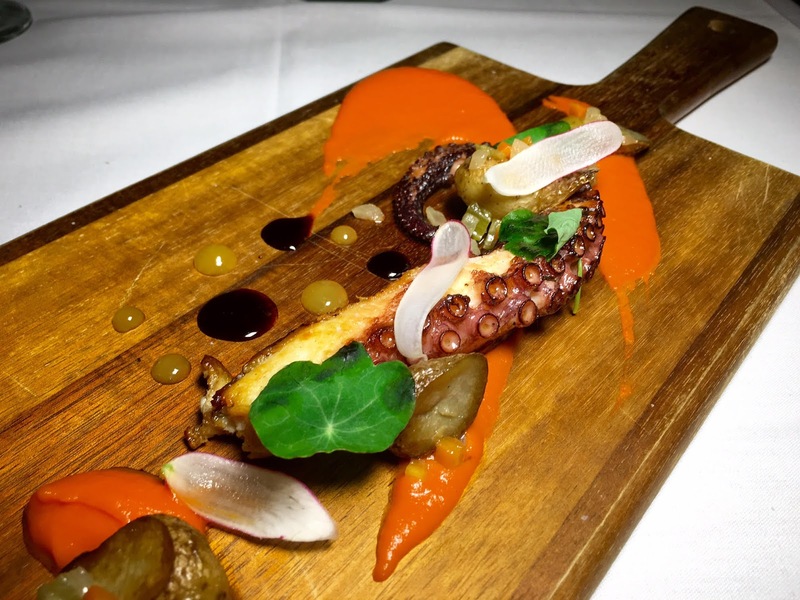 We've touted others as preparing the most tender pulpo in the city, but they've been topped. Chef DJ presented THE most delicious octopus....ever. Spanish octopus was marinated in salt water brine and braised in a paprika sauce before being char-grilled to create that crispy outer crunch, and served with fingerling potatoes, Sofrito, dots of Pedro Ximénez sherry vinegar and passion fruit coulis and splashes of a rich, intensely flavorful roasted red bell pepper coulis. Talk about tender! Next we indulged in a super tender, sugarcane-lacquered pork belly served with goose berries, watercress, apples and a smear of pickled red dates. Again, a beautiful, thoughtful and delicious dish. Can they all be our favorites? This one could even be a dessert. 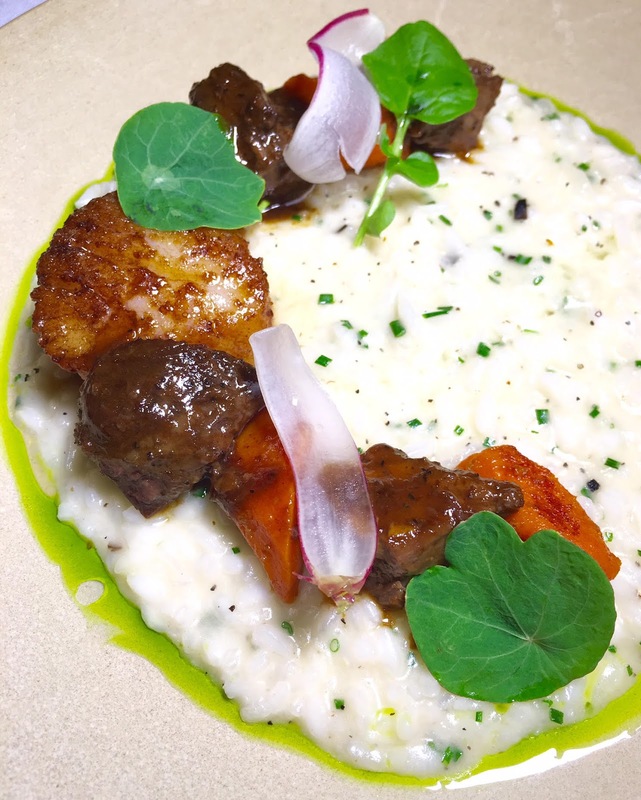 The savory finale was the decadent truffle risotto with perfectly-seared Maine diver scallop and braised pork cheek, accented with mustard greens, watercress, and carrot. 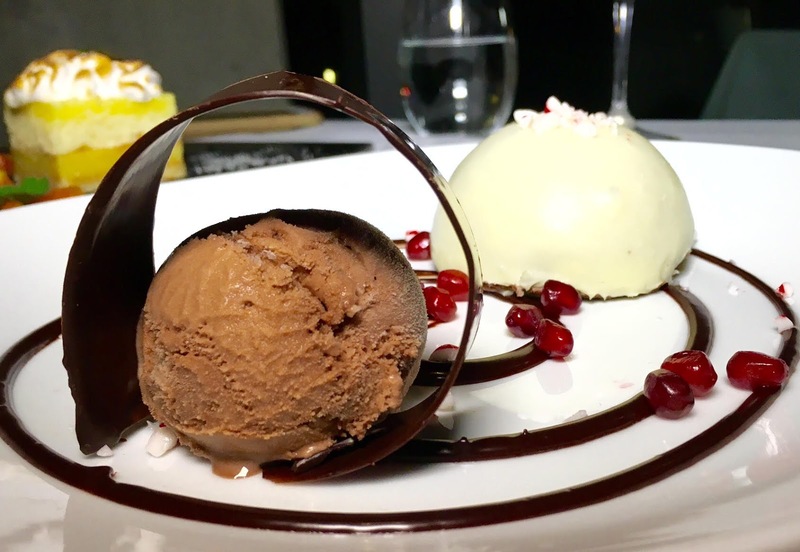 As if we were not already completely spoiled and satisfied, then came dessert. We had no idea how much room we could make in our full bellies for the luxurious chocolate peppermint dessert, a dark chocolate peppermint mousse coated in white chocolate ganache, a scoop of chocolate ice cream and a generous drizzling of hot fudge and sprinkling of juicy pomegranate seeds. 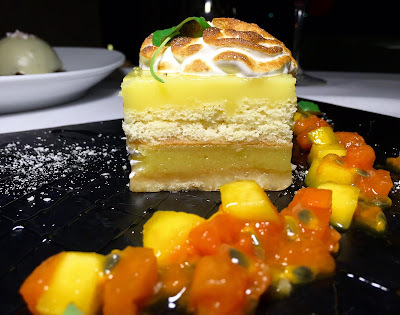 Not to mention the exquisite lemon meringue pie made with layered shortbread, lemon curd, vanilla chiffon, and basil gel topped with mint sugar, and served with fresh mango, papaya and passion fruit. Light and refreshing, yet simultaneously rich and complex. After such opulence, we gratefully retired to our lavish suite where we opened the balcony doors to welcome the Pacific breezes and sounds of the thundering waves just steps away. We popped open a bottle of wine before sinking into the hot whirlpool tub and eventually drifting off into delicious dreams...only to awake to the pacifying sounds of the ocean and warm breakfast in bed. Gluttons? Perhaps. Worth it? Definitely. JRDN and Tower 23 Hotel are located at 723 Felspar Street in Pacific Beach. For more information, visit t23hotel.com and check out the hotel walk-through video below.